When I reached the end of Life Is Strange’s third episode, a scrolling message caught my attention. Reeling from yet another emotional punch to the heart, I discovered that DONTNOD created a page on their website that offers support services for players affected by the content of the game. Because Life Is Strange is upfront about mature subjects like bullying and suicide, lifeisstrange.com/talk is a valuable resource that puts triggered players in touch with suicide prevention call centers and anti-bullying counselors. In other games, this might be a shallow attempt to foster ill gotten buzz and publicity. However, because Life Is Strange is upfront in its desire to tell a story deeply rooted in the adolescent experience, a resource such as this is valuable given the aftermath of the previous episode’s terrible finale. It also made me realize that I owe sensitive readers an apology. Life Is Strange deserves to be played but for those in which bullying serves as an emotional trigger, please tread carefully. The apex of the five episode series, the mood of “Chaos Theory” hinges entirely on Max’s actions in “Out of Time.” In my case, a dark and heavy cloud clings to Blackwell Academy as the student body reels from disaster. I feel bad praising such a topic, but Life Is Strange does a magnificent job of recreating the effect death has on a population. The episode’s opening moments sees Max disgusted with the community’s sudden outpouring of love and support despite not giving one damn about a certain someone when she was alive. And because I was unable to foster a positive outcome, poor Max became the target of unwanted and unjustified hate and malice. While I feel bad that the end of “Out of Time” proved to be disastrous, “Chaos Theory” - and I hate to use this word - benefits from the failed outcome because it gives adds a powerful feeling of loss, confusion, anger, and sadness. The death motivates Max to team up with Chloe, who is still intent on discovering what happened to Arcadia Bay’s sweetheart Rachel Amber. Hoping for a connection between Rachel and the recently deceased, Max goes along with CHloe’s daring plan to infiltrate the principal’s office and search for clues. What begins as a fact finding mission becomes a journey of soul searching as the experience allows the damaged bond between Max and Chloe to heal as the two girls spend time together in the empty school. In “Out of Time,” Max didn’t get much time with Chloe because of a sudden sad turn of events. “Chaos Theory” gives these characters all the time in the world to develop. Through their time together, we learn more about what makes Chloe so rebellious, as her life was deeply affected by the death of her father in a car accident. A turning point for Chloe, it was the moment that led her down the path of rebellion and into the friendly arms of Rachel Amber. While Max struggles to comprehend the nature of her powers, especially in light of her failure in “Out of Time,” the story takes an extraordinary and unexpected twist that gives Max a chance to do what all of us would give our souls for: to change the past. By now, however, both Max and the player must understand that every change comes at a cost and in the game’s shocking final moments, Max may not be prepared to cope with such a price. And just like the last episode, I was left feeling pained and physically upset. DONTNOD makes drama look easy. They’ve created set pieces that feel neither forced or manipulative and are bolstered by a talented and natural sounding voice cast, good narrative direction, and Jonathan Morali’s hauntingly sweet score. In previous episodes, the hints and visions Max and the citizens of Arcadia Bay witness as precursor to the apocalyptic event shown at the beginning of the game ultimately takes a back seat to the greater drama that affects Max and those around her. There is another unexpected event at the end of the episode but it doesn’t seem so important to what Max experiences after her powers reach a new plateau. 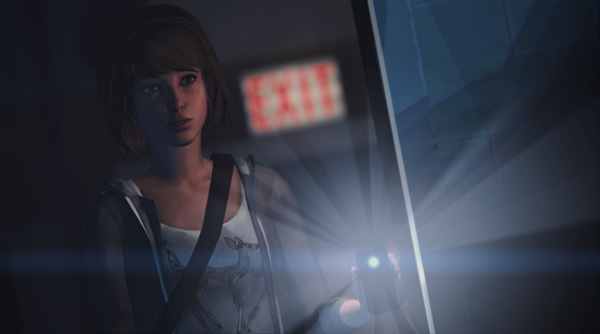 “Chaos Theory” is Life Is Strange at its most sweetest and heartfelt. Both girls work together to uncover clues regarding the disappearance of Rachel Amber but the journey quickly turns inward as Chloe becomes a major part of Max’s life again. Their rekindled friendship is the engine that drives the episode’s final shocking moments, intense cliffhangers that have become the game’s tentpole feature. From a gameplay perspective, episode three is one that offers a decent amount of payoff to decisions made in the first two episodes. Some of the consequences are quite minor but looking at the global choice list as it appears at the end of the chapter, I was surprised to discover that I missed quite a few things. None of them look particularly earth shattering - for now - but I worry I’m going to miss out on something. I try not to replay through episodic games but this is one I may end up making an exception. Life Is Strange continues down the path of excellent, mature storytelling that no other studio has been able to match. It answers questions while raising more and I’m on the edge of my seat with excitement to see how the episode’s final moments will guide the story and the decisions I’ve made to this point. Like the previous episodes, the game continues to be a rollercoaster of emotions offering laughs, tender sweetness, and tragedy with little warning. With the game’s characters and community happenstances firmly grounded in reality, Life Is Strange is easy to connect with. Furthermore, the conflict and drama surrounding Blackwell is far more genuine and relatable than any other game of its kind.